Are you displaying digital signage on an UltraWide monitor, video wall or any other nonstandard proportion device? Then, custom resolution is what you need. This option is part of the layout section in your campaign editor. If you don’t know yet how to create different screen layouts, adding different divisions and changing from landscape to portrait mode, check this tutorial. In your OnSign TV account, edit an existing Campaign or create a new one. 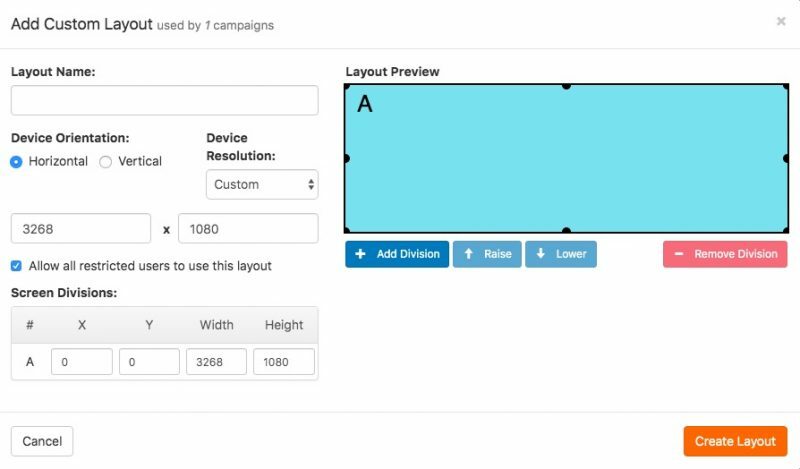 Click on “Add Custom Layout” on the Screen Layout section. Define the Device Orientation and then click on “Device Resolution”. Select “Custom”, the last item from the list. Type in the desired resolution. In this tutorial, we match the resolution to the size of a two monitor video wall placed side by side in landscape mode. The first screen is 1920 x 1080 and the second is 1366 x 768. We need to add the width and take the higher one's height. This will give us our result: 3268 x 1080. Enter the divisions in the new layout and confirm with "Create Layout". Now you can starting adding the content to your campaign!